- So how are you looking forward to celebrating the Winter Solstice this year? 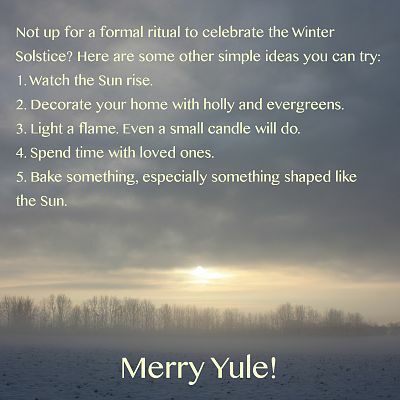 Not up for a formal ritual to celebrate the Winter Solstice? Here are a few ideas for some lovely, low-key ways to acknowledge the changing of the seasons. What would you add to the list? Decorate your home with holly and evergreens. Light a flame. Even a small candle will do. Bake something, especially something shaped like the Sun. Is this something I can buy? The best things in life are free. This is just a neat little something we thought you’d enjoy. Feel free to pin it or share it on social media. We do have some cool things for sale, though. Be sure to click on the menus at the top of this page to explore our site further.